Participants will investigate the behavior and morphology of basaltic lava flows from two very different but related perspectives: field observations of basaltic lava flows in Iceland and large-scale lava flow experiments conducted at Syracuse University. Experiments will be designed to constrain the factors that control various features found in the natural lavas. 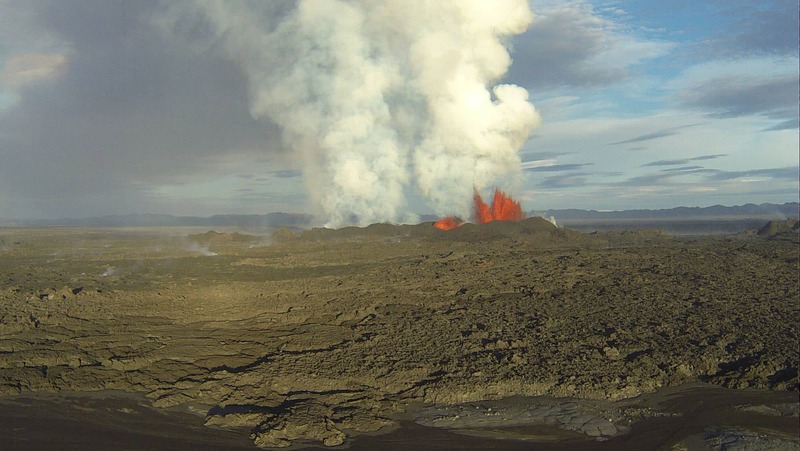 What: The project will tour key volcanic features in Iceland before focusing for about 10 days in the 1974-1984 basaltic lava flows of Krafla in northern Iceland. Field investigations will identify different features of lava flows and be the basis for designing specific lava flow experiments conducted under the SU Lava Project (http://lavaproject.syr.edu). The experiments will use re-melted ancient basalt to make lava flows up to a few meters across under varying conditions of temperature, effusion rate, slope, and substrate. Data collected during the experiments and from dissected flows will be available for continuing studies. These experiments represent uncharted territory in the study of basaltic lava flows. Project Overview and Goals: Basaltic lava flows constitute the most common and voluminous volcanic outpourings on Earth and the terrestrial planets. Besides highly visible basaltic eruptions this year in Hawai’i, Iceland, Italy and Siberia, ancient basaltic lavas also dominate vast areas of the continents and almost the entire deep seafloor. Despite the significance of basaltic lava flows, many questions remain regarding the behavior of lava flowing across the surface and the interpretation of features found in ancient lavas. Active lava flows take place in remote locations and under conditions that are essentially uncontrolled. At best, key aspects of flows can be reconstructed so some extent. In large-scale experimental lava flows at Syracuse University, the individual (and combined) effects of the primary factors that influence lava flows can be investigated in a safe, controlled environment. Data recorded during the experiments can be compared to features of the cooled flows and to features in ancient lava flows. Documenting the effects of key parameters on lava flow processes is necessary for understanding the accretion of lava flow fields, assessing hazards, and understanding the significance of lava flow morphologies on Earth, the seafloor, and other planetary bodies. In 2014-15 a similar project yielded exciting results and experience for improving projects in the coming year. In particular, for 2015-16 students will have more background preparation for their projects from readings as well as lectures both before the field part of the project and during or after the experimental part of the project. There will be additional time provided for initial analysis of data so that projects can have a fast start in the following fall semester. Potential Student Projects: Students will be encouraged to participate in designing and planning their research projects with guidance from the instructors. Some possible projects are listed below. Note that all projects can be adapted to fit the interests of their faculty advisors and available analytical facilities. These may involve varying degrees of descriptive, analytical, and theoretical approaches that can be explored in depth back at the students’ home institutions. Although these projects encourage integrating field and laboratory results, projects that focus strongly on only one of these perspectives are also possible. The instructors will help coordinate the projects with the students’ faculty advisors. Pahoehoe/A’a transition. These two lava morphologies are well known and fundamental to introductory geology classes. Despite their common occurrence, the factors that determine these forms remain a matter of discussion. Led by observations from Iceland, experiments at SU will attempt determine the conditions that control transitions between these morphologies. Reactivation of lava flows from accumulated spatter. Fire fountaining near eruptive fissures show evidence of this type of lava flow. Field observations at hornitos and spatter ramparts can help establish criteria for recognizing these types of flows and determining their conditions of formation. Using our furnace it is possible to make spatter accumulations to explore the conditions under which the base of spatter piles can be remobilized. Folding of lava flow surfaces. Observations in the field and on experimental lavas show evidence of the complex folding that affects pahoehoe flow surfaces. Measurements of fold dimensions in the field in Iceland and on fully documented flows at SU can be used to evaluate lava crust rheology and previous approaches based on classical folding theory. Smooth lava pillows in breakouts and tumuli. A curious feature of many crestal fissures on tumuli and monocline-like folds in sheet-like flows are bulbous, pillow-like buds with very smooth skins. These notably lack the typical fractured, stretched or folded features seen on other nearby lava surfaces. They appear like blisters on the surface of bent flows or on small fissures. Similar features are typical of low-velocity breakouts in our experimental lava flows. A combined field and experimental investigation of these lava blisters would be an interesting project. Non-tumulus lava inflation features. The lava field at Krafla shows spectacular examples of inflation over a broad, planar zone, primarily expressed as the extensional separation of plates in pahoehoe that accommodated the upwelling of fluid interior lava along cracks reminiscent of mid-ocean ridge spreading centers. These include offsets along transform-like offsets, axial ridges, and the development of smooth (degassed?) bud like protrusions either in isolation or in clusters. This sort of inflationary landscape has heretofore never been described in the literature. Experiments at low flow rates, low temperatures and gentle slopes commonly produce inflated / collapsing flows that could be useful analogs. Flow segregations in lava flows. Lava flows commonly have concentrations of vesicles or crystals in bands parallel to the flow margins. Sorting mechanisms have been proposed involving particle interactions during rapidly increasing viscosity. Excellent examples of lava flows with these textural types are common in Iceland and we have made some similar textures using olivine crystals added to lava before it is poured in our experiments. Integrating these perspectives could be the basis for an excellent project involving analog materials, textural studies (preferred orientations, evaluation of strain, liquid-crystal reactions, etc.) or other related aspects. Working Conditions: Iceland is a spectacular setting for the field portion of this project. Travel from JFK is only about 6 hours by air. No visas or work permits are required. It is a very tourist-friendly environment where nearly everyone speaks English. Reykjavik is a very European city and there should be a chance to visit some of its main sites. Upon arrival the group will begin a tour of volcanic features around Iceland ending up in the sparsely populated areas in the north. Depending on conditions and access, we may be able to visit the Holuhraun eruption site (still active in December 2014). 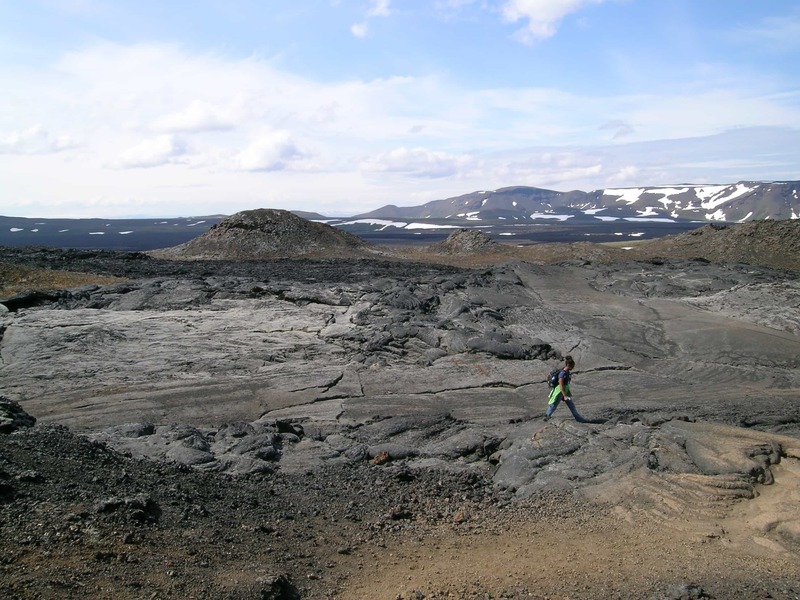 Field projects will be centered on spectacular lava flows near Krafla Caldera that last erupted in the mid-1980’s. Accommodations will be at small guesthouses and a permanent house owned by the University of Iceland near Krafla. If accommodations are secured, no camping will be required. Students should be prepared to work all day outdoors under moderately cool (typically ~50°F) and possibly rainy conditions. Students should be expected to be able to hike for several kilometers over mostly gentle topography but very rough and uneven volcanic landscapes. We will be near small towns but students need to bring all necessary field gear. There are no dangerous plants, animals or insects. At 66°N, the sun will not set for the entire time we are in Iceland. In Iceland, students should be prepared to live and work in close conditions with others. Shared rooms, in some cases with bunk beds and shared toilet facilities should be anticipated. Participants take turns preparing meals and helping with cleaning around the house. If we are camping expect to share a tent and responsibilities for the group. During group travel on our tour or working on our field projects requires that all students take responsibility for being on time for all activities. Syracuse University is located in Syracuse, NY in the Finger Lakes Region of central NY. University housing and meals will be available at walking distance to the Comstock Art Building where the lava flow experiments will be conducted. Travel can be arranged through Hancock International Airport, Amtrak, or bus service. Safety: Iceland: While all field investigations have their inherent risks, fieldwork in Iceland is particularly forgiving. Should they be necessary, excellent emergency services are available, in most cases within 2 hours of all of the target areas. Colleagues at the University of Iceland will be available if any assistance is required. Cell phone communication is available in all areas of study. Internet access is available only periodically and should not be expected. 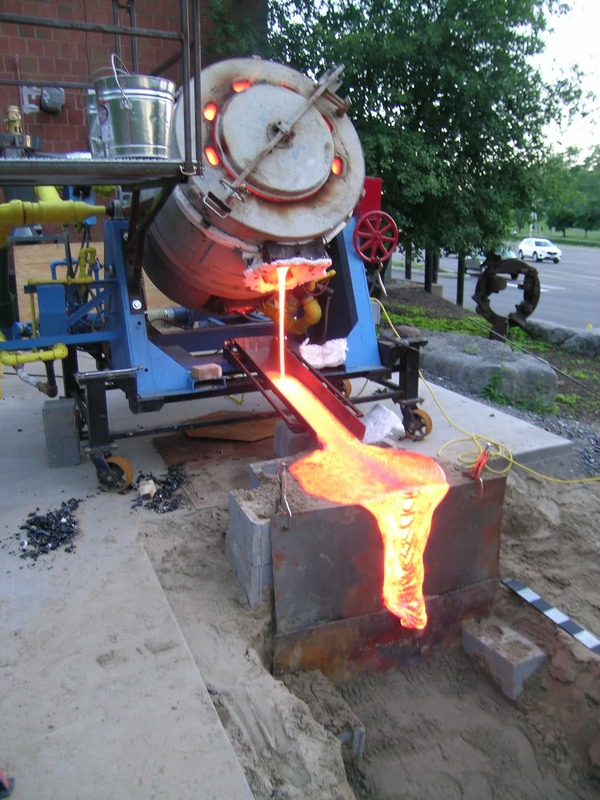 Syracuse University: Despite working with molten lava, experiments in the SU Lava Project are extremely safe. With the experience from >100 lava flows in many different conditions, there is no danger of violent activity, even for flows poured directly into water. Working around our lava flows is no more dangerous than being around a wood-burning stove or fireplace. The lava will be poured by Professor Robert Wysocki and his trained technicians. Students directly engaged in experiments will use appropriate protective gear (goggles, gloves, leather overalls, etc.) at all times. Recommended Courses/Prerequisites: Students will get the most out of the program if they have completed courses in mineralogy, petrology or volcanology, and structural geology. Field geology experience would be a plus. A solid understanding of the basic principles taught in introductory geology classes and strong motivation are sufficient. Costs & Financial Arrangements: Travel, housing and field costs will be covered by the project. Student stipends will be $1000, less than the typical Keck stipend of $1,500 due to the high cost of airfare and expenses in Iceland. Students should budget for any extra food or supplies they might want, souvenirs, etc.